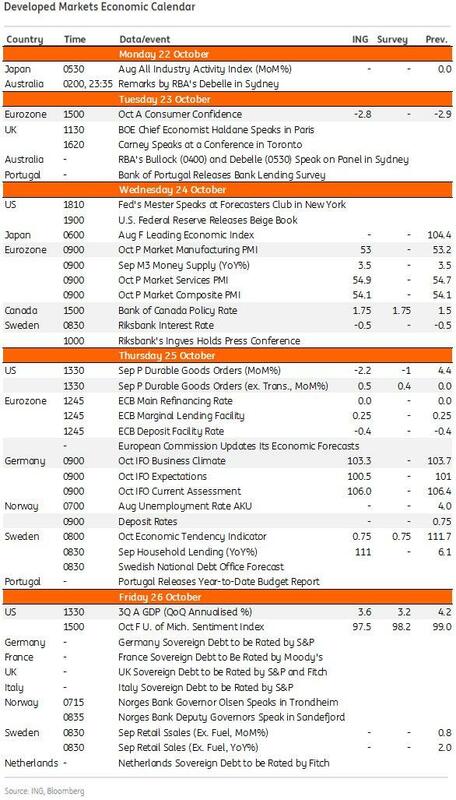 In what is shaping up as another extremely busy week, events in the coming days include the ECB meeting, the advance Q3 GDP release in the US, preliminary October PMIs in Europe and the US and the release of the Fed’s Beige Book. In addition, WTO officers will meet to discuss reforms for the trade body, Saudi Arabia will hold its troubled “Davos in the Desert” conference, and a steady stream of central bank speakers are scheduled. Last but not least, this will be the peak weak for US corporate earnings with roughly a third of S&P members reporting. Going down the list, the ECB will meet on Thursday, and although policy rates are expected to be left unchanged, the meeting is likely to be closely watched for more color on how the ECB will reinvest maturing QE proceeds post the likely end of QE in December this year according to Deutsche Bank's Craig Nicol. This will be amidst an uncertain growth and inflation outlook for the Euro-area given Italy's populist 2019 budget, continued fraught Brexit negotiations and the implementation of additional US tariffs on China since the last ECB meeting. It’s hard to imagine the ECB will lower the pressure on Italy and following Friday's credit rating downgrade, its likely to be a busy back end of the week for Italy. In this context, late on Friday Moody’s decided to leave Italy’s rating at stable after a 1-notch downgrade to Baa3. "If there’s one thing the outlook isn’t for Italy at the moment it’s stable but rating agencies are unlikely to want to create a vicious circle" DB's Jim Reid writes this morning. With S&P opining on Friday it’s possible we’ll see a similar response for a similar reason. Italy rallied strongly on Friday (10yr BTPs -20bps, 24.6bps tighter to Bunds) before Moody’s decision which came after the US close. Away from this we will also be getting a first look of Q3 GDP for the US on Friday, where the current consensus is of annualized growth at +3.3% qoq, slowing from +4.2% qoq in Q2. The Q3 GDP price index is expected to come at +2.3% as against +3.0% in Q2. Meanwhile it's a fairly quiet week for other data next week, with the highlight being the release of the flash October PMIs in Europe and the US on Wednesday. For the Eurozone, the composite is expected to stay more or less stable at 54.2 with both the manufacturing and services components expected to come down to 53.0 (from 53.2 last month) and 54.5 (from 54.7) respectively. In the US, the services print is expected to jump to 54.0 from 53.5 while the manufacturing reading is expected to come down marginally to 55.5 from 55.6. Looking at key US events, we get the September Chicago Fed National activity index on Monday. On Tuesday there’s the October Richmond Fed manufacturing index. On Wednesday, we have the Fed's beige book, August FHFA house price index and September new home sales. On Thursday, there are preliminary September wholesale inventories, durable goods orders and capital goods orders along with the September advance goods trade balance, retail inventories and pending home sales, as well as the October Kansas City Fed manufacturing index. Finally on Friday we have the final University of Michigan October survey results. In Europe, on Monday we get Germany's September PPI. On Tuesday there are France's October business and manufacturing confidence indicators, the Euroarea's September M3 money supply and the UK's September finance loans for housing. Wednesday brings Germany's November GfK consumer confidence and October IFO current conditions survey, Spain's September PPI and France's Q3 total jobseekers data. Finally on Friday, the ECB's survey of professional forecasters is out, along with France's October consumer confidence and September PPI. In Asia, we get China's September new home prices this coming Sunday, Japan's preliminary October PMI on Wednesday and September services PPI on Thursday. Away from data, the BoE's Carney and Haldane, and the Fed's Kashkari and Evans will speak on Tuesday. The Fed's Bostic, Bullard and Mester will speak on Wednesday, and the Fed's Mester and the ECB's Draghi and Coeure will speak on Friday. Finally, Saudi Arabia's “Davos in the Desert” event will start on Tuesday through to Thursday. However, the event has seen withdrawals from many key executives and attendees after the disappearance of government critic Jamal Khashoggi at the Saudi consulate in Turkey. Elsewhere, WTO officers will meet in Ottawa to discuss reforms for the trade body and the European Council President Donald Tusk and the European Commission President Jean-Claude Juncker will present conclusions from the October 18-19 summit to the EU Parliament on Wednesday. We also have a slew of earnings due this week with Amazon, Alphabet, Intel, Microsoft, Texas Instruments, Twiiter, Verizon, AT&T, Ford, Daimler, Lockheed Martin, Harley Davidson, Boeing, UBS, Barclays, Total, United Technologies and Caterpillar all slated to report their earnings. Monday: It’s a very quiet start to the week. Overnight, we get August’s all industry activity index in Japan. In Europe, we get the Euro-area's 2017 government debt to GDP ratio. In the US, we get the September Chicago Fed National activity index. Tuesday: Things continue to remain light on Tuesday. Overnight, we get Japan's September supermarket sales and final September machine tool orders. In Europe, we get the Euro Area's October consumer confidence, Germany's September PPI, Spain's August trade balance and in the UK the October CBI Trends total orders, selling prices and business optimism. In the US, we get the October Richmond Fed manufacturing index. Away from data, BOE Governor Carney and Chief Economist Haldane, and the Fed's Kashkari and Evans will be speaking at different times. Besides, Caterpillar, Verizon, Texas Instruments, Lockheed Martin, United Technologies and Harley Davidson will release their earnings. Wednesday: Data picks momentum from Wednesday as we get preliminary October PMIs across the globe. We get Japan's October manufacturing PMI overnight followed by the release of composite, manufacturing and services PMIs for France, Germany and the Euro Area in the morning and then we get US composite, manufacturing and services PMI in the afternoon. Besides, we will also be getting France's October business confidence, manufacturing confidence, production outlook indicator and business survey overall demand along with September’s M3 money supply for the Euro Area and September finance loans for housing in the UK. In the US, we get latest weekly MBA mortgage applications, August’s FHFA house price index, September’s new home sales and the Fed's latest Beige Book. Away from data, the Fed's Bostic, Bullard and Mester will be speaking at different times. The European Council President Donald Tusk and the European Commission President Jean-Claude Juncker will present conclusions from the October 18-19 summit to the EU Parliament. Besides, Barclays, Microsoft, AT&T, Boeing and Ford will report their earnings. Thursday: The key highlight of the day is the outcome of the ECB’s monetary policy meeting. Overnight we get Japan's September services PPI. In Europe, we get Spain's September PPI, Germany's October IFO business climate, expectations and current assessment index along with France's 3Q total jobseekers data. In the US, we get preliminary September wholesale inventories, durable goods orders and capital goods orders along with October’s Kansas City Fed manufacturing activity index, latest weekly initial jobless claims and continuing claims, and September’s pending home sales, advance goods trade balance and retail inventories. Away from data, UBS, Daimler, Twitter, Alphabet, Amazon and Intel will release their earnings. Friday: The key highlight of the day is the advance Q3 GDP release for the US and the outcome of S&P's sovereign ratings review for Italy. Overnight we get October CPI for Tokyo in Japan. In Europe, we get the ECB’s survey of professional forecasters along with France's September PPI and October consumer confidence. In the US, we get the final University of Michigan October survey results as well as advance Q3 personal consumption, GDP price index and core PCE. Away from data, the ECB's Draghi and Coeure will be speaking at different times. In addition, Total will release its earnings. Finally, focusing just on the US, Goldman notes that the key economic releases this week are the durables report on Thursday and the Q3 GDP advance estimate on Friday. There are several scheduled speaking engagements by Fed officials this week, including a speech by Vice Chairman Clarida on Thursday. 09:30 AM Minneapolis Fed President Kashkari (FOMC non-voter) speaks; Minneapolis Fed President Neel Kashkari will speak at a conference on Early Childhood Development and Education. 01:30 PM Atlanta Fed President Bostic (FOMC voter) speaks; Atlanta Fed President Raphael Bostic will speak about the U.S. economy and monetary policy. Media Q&A is expected. 02:15 PM Dallas Fed President Kaplan (FOMC non-voter) speaks; Dallas Fed President Robert Kaplan will speak in Galveston, Texas. 08:00 PM Kansas City Fed President George (FOMC non-voter) speaks; Kansas City Fed President Esther George will speak on the U.S. payment system on a panel in Sydney. 10:00 AM New home sales, September (GS -0.9%, consensus -0.6%, last +3.5%); We estimate new home sales declined by 0.9% in September, following a 3.5% increase in the prior month. We expect the effects of Hurricane Florence to weigh on new home sales. Single family starts decreased in August, while mortgage applications were roughly flat. 01:00 PM Atlanta Fed President Bostic (FOMC voter) speaks; Atlanta Fed President Raphael Bostic will take part in a discussion at the LSU Energy Summit in Baton Rouge, Louisiana. Audience Q&A is expected. 01:10 PM Cleveland Fed President Mester (FOMC voter) speaks; Cleveland Fed President Loretta Mester will speak at the Forecasters Club in a moderated discussion in New York. Audience Q&A is expected. 02:00 PM Beige Book, October FOMC meeting period; The Fed’s Beige Book is a summary of regional economic anecdotes from the 12 Federal Reserve districts. The September Beige Book reported growth at a moderate pace across the country and noted a positive outlook for overall near-term growth, though business contacts in most districts expressed concerns related to trade policy uncertainty. Labor markets were reported to be tight throughout the country, with “widespread” labor shortages including continued shortages of high-skill workers and a number of Districts reporting increased shortages of lower-skill workers. Wage growth was overall modest to moderate, and price increases were also modest to moderate across regions, though all Districts reported increased price pressures. In the October Beige book, we look for additional anecdotes related to labor markets, wage growth, price inflation, and trade policy uncertainty. 07:00 PM Fed Governor Brainard (FOMC voter) speaks; Fed Governor Lael Brainard will speak at an event in New York for the promotion of economic and financial literacy. 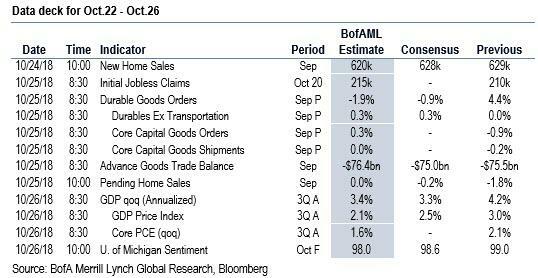 08:30 AM U.S. Census Bureau Report on Advance Economic Indicators; Advance goods trade balance, September (GS -$78.0bn, consensus -$75.1bn, last -$75.5bn); Wholesale inventories, September preliminary (consensus +0.5%, last +1.0%): We estimate that the trade deficit increased in September, as goods imports likely rose further. Outbound container traffic rose by less in the month than did inbound container traffic. We note the possibility that some amount of pull-forward of imports likely occurred before the $200bn round of tariffs took effect on September 24. 08:30 AM Durable goods orders, September preliminary (GS -1.0%, consensus -1.5%, last +4.4%); Durable goods orders ex-transportation, September preliminary (GS +0.6%, consensus +0.4%, last flat); Core capital goods orders, September preliminary (GS +0.4%, consensus +0.5%, last -0.9%); Core capital goods shipments, September preliminary (GS +0.4%, consensus +0.4%, last -0.2%): We expect durable goods orders to decrease in the September report, given weaker data from commercial aircraft orders. Given strength in manufacturing surveys from earlier in the month, we see scope for further core capital goods orders growth. Manufacturing production growth was in line with expectations in September, but there was significant growth in the capex-sensitive business equipment category of industrial production. Accordingly, we look for a 0.4% increase in core capital goods shipments. 08:30 AM Initial jobless claims, week ended October 20 (GS 215k, consensus 213k, last 210k); Continuing jobless claims, week ended October 13 (consensus 1,660k, last 1,640k): We estimate jobless claims increased by 5k to 215k in the week ended October 20, following a 5k decrease in the prior week. While claims did not appear elevated last week in Hurricane Michael-affected states, we note that claims typically increase in the weeks following the week of the hurricane. 10:00 AM Pending home sales, September (GS -0.5%, consensus -0.1%, last -1.8%); We estimate that pending home sales declined by 0.5% in September, following a 1.8% decrease in the August report, due to weaker regional home sales data so far in September. We have found pending home sales to be a useful leading indicator of existing home sales with a one- to two-month lag. 12:15 PM Fed Vice Chairman Clarida (FOMC voter) speaks; Fed Vice Chairman Richard Clarida will speak about his outlook for the U.S. economy and monetary policy in Washington. Q&A is expected. 09:00 PM Cleveland Fed President Mester (FOMC voter) speaks; Cleveland Fed President Loretta Mester will speak to the Money Marketeers of New York University. Audience and media Q&A is expected. 08:30 AM GDP, Q3 advance (GS +3.5%, consensus +3.4%, last +4.2%); Personal consumption, Q3 advance (GS +3.4%, consensus +3.2%, last +3.8%); We estimate a +3.5% increase in the first vintage of Q3 GDP (qoq ar). We expect the composition of the report to reflect solid growth in personal consumption (+3.4%) and business fixed investment (+2.9%) alongside a significant boost from federal government spending (+5.0%). We also expect strong inventory growth to contribute 1.9pp. 10:00 AM University of Michigan consumer sentiment, October final (GS 98.6, consensus 99.0, last 99.0); We expect the University of Michigan consumer sentiment index to edge down 0.4pt from the preliminary estimate for October due to the stock market decline. The report’s measure of 5- to 10-year inflation expectations stood at 2.3% in the preliminary report for October.